if the fail is due to fraudulent information, PMI may take disciplinary actions (including banning from application to PMI certification for life) to the candidate in question as PMI takes integrity very seriously. Therefore, when submitting the PMP® application / PMI-ACP® application, always make sure you are entering truthful information. Honest is the best policy. If I do not want to proceed with PMI Audit, what should I do? If you decide NOT to proceed with the PMI Audit for whatever reasons, e.g. time clashes, supervisor disagreed with your claimed time, personal issues, etc., you need not do anything. PMI considers it an automatic audit fail if it does not receive your audit package within 90 days of the notice of PMI Audit. You will be able to apply again for the PMP® Certification / PMI-ACP® Certification one year after your original PMP® application / PMI-ACP® application submission date. But you should note that your application will be subject to a PMI Audit again. Do I need to be the project manager / Scrum Master to apply for PMI-ACP Exam? As you can see, again the keyword here is “working on“, you can be a developer, sponsor, product owner, business analysts, etc. as long as your projects make use of Agile methodologies. 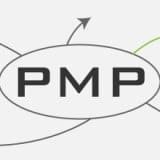 If you happen to be a PMP®, the 1st requirement for the 2000 working hours will be automatically fulfilled as the number of hours of project management experience required to fulfill PMP® requirements is more. 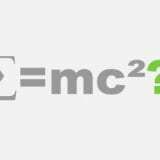 What is the passing score for PMI-ACP exam? The short answer is “unknown”. However, according to the trainers of PMI-ACP® Agile Certification aspirants, most of them would estimate that the passing score is around 70% (which, by the way, is a bit higher than the passing score of PMP® Exam). This may be because the PMI-ACP® Exam is generally considered a bit easier than the PMP® Exam (but this is just an educated guess only as no information has been disclosed by PMI). Therefore when you are attempting PMI-ACP® sample exam questions, it is highly recommended to set a higher standard than 70% (e.g. 75% – 80%) for your mock exam performance so that you can walk into the PMI-ACP® Exam centre with better confidence of passing the exam in first attempt. After having taken both PMP® and PMI-ACP® Exams with a pass in first attempt, I would say that the PMI-ACP® exam is easier than the PMP®. But there are more situational questions in the PMI-ACP® Exam as Aspirants are tested on the actual application of Agile knowledge rather than testing their memorization capability. How hard or difficult is the PMI-ACP Exam? I have both tackled the PMP® and the PMI-ACP® Exams administrated by PMI. My experience tells me that the PMI-ACP® Exam is not that hard or difficult if you have ample preparation for the test. 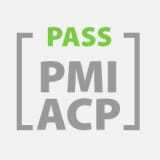 I passed with all Proficient in my PMI-ACP® Exam while I got 4 P and 1 MP for the PMP® Exam. So for Aspirants who have attempted PMP® Exam before, the good news is PMI-ACP® is a bit easier. You have around 1.5 minute to answer each question — the time is more than enough for most candidates. Some candidates can even finish all the 120 questions within 1 hour and take an extra hour for re-reading the questions and checking the answers. According to the feedback of many Aspirants who are PMP®s, the exam is considered to be moderately easy (in particular when compared to the PMP® Exam). The majority of PMI-ACP® Exam questions are situational — the format is somewhat like this: you have got a situational in which you need to decide which is the best course of action to follow from a choice of four, and two or even three of theses choices are logical actions but you need to choose “the best according to PMI”. You have to follow strictly the check in and check out procedures of PMI exams and you need to get accustomed to the exam interface. The exam covers a lot of different Agile favours, including Scrum, Lean, Kanban, Extreme programming, etc. that one need to understand in details. 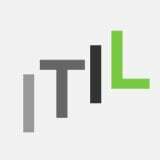 Perhaps one of the most difficult part of the certification is to fulfil the experience requirement on traditional project management as Agile project management is very different from waterfall. It would normally take around a total of 120 hours to prepare well for the exam (of course that depends on the Agile knowledge and experience one has — I have known someone who can pass with 1 week of study though). 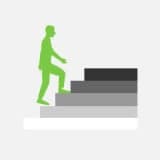 You should select an Agile course that helps you to prepare for the PMI-ACP® Exam (I used the Agile PrepCast™). Though any Agile courses (e.g. ScrumMaster) with over 21 hours of course duration will satisfy the 21 Contact Hours requirement of the PMI-ACP® Certification, taking a course dedicated to the PMI-ACP® would help build the foundation of your exam prep as the exam tests you on broader Agile knowledge than specific Agile methodologies. Read and study the “pseudo-official” PMI-ACP® Exam textbook – PMI-ACP® Exam Prep by Mike Griffiths – at least twice and finish all the sample exam questions there. Practice more PMI-ACP® Exam sample questions (many are FREE). You are also advised to write your own study notes for your last minute revision. That said, with proper training and preparation, Aspirants would be able to pass the exam in first try. You may refer to my PMI-ACP® Exam experience here. Is there “PMI-ACP Body of Knowledge”? For the PMP® Exam, the PMBOK® Guide (A Guide to the Project Management Body of Knowledge) is believed to be the most popular study material / book. 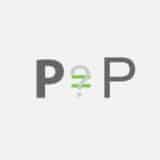 Many PMI-ACP® aspirants would ask is there a PMBOK® Guide equivalent for the PMI-ACP® Exam. The answer is, unfortunately, NO. PMI does provide a list of PMI-ACP® Exam reference books (a total of 11 Agile books with over 3800 pages!) which, in total, is way thicker than the PMBOK® Guide. 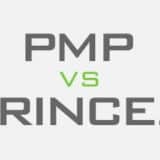 That’s why some project managers consider the PMI-ACP® Exam to be even more difficult than the PMP® exam. This is my recommended exam prep book for the PMI-ACP® Exam. I made use of this book during my exam study and considered it to be excellent in quality. The author Mike Griffiths is a renowned Agile trainer and practitioner who has help formulating the PMI-ACP® Exam structure and syllabus – who else could be more familiar with the PMI-ACP® Exam than this insider? In the PMI-ACP® exam lessons learned I have read, almost 90% of the authors used this PMI-ACP® Exam prep book to help them prepare and pass the PMI-ACP® Exam. Where to find Head First PMI-ACP? For those who are familiar with the PMP® Exam, or who are PMP® themselves, the PMP® Exam prep book “Head First PMP®” should be a popular choice for their PMP® exam. The Head First PMP® book is written using “the latest development in cognitive science” and is most suited visual learners. A lot of diagrams, charts, illustrations and games are included in the Head First PMP® book. Unfortunately, the answer is NO. The authors of the Head First PMP® do not write the Head First PMI-ACP® for PMI-APC aspirants. Great News! Head First Agile will be available for Aspirants in 25 June 2017. Though Head First Agile is primarily about Agile concepts, it intends to have 100% coverage of the exam syllabus for PMI-ACP® exam — including end-of-chapter quizzes, exam tips and guide and a full-length PMI-ACP® practice mock exam. The links of the above PMI-ACP® Exam prep books go to the Amazon website where you can get a preview of the books. I did make use of these exam prep books for my PMI-ACP® Exam and they are really of superb quality. If you have the budget, do purchase these two books for your PMI-ACP® study and you will not regret it. Sometimes, PMI-ACP® aspirants may encounter courses that gives both the contact hours and professional development units (PDU). What is the difference between Contact Hours and PDU? Before PMI-ACP® certified, one will only be able to get Contact Hour. PMI-ACP® aspirants needs 21 Contact Hours of Agile project education to qualify for the PMI-ACP® Exam. 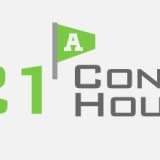 The 21 Contact Hours should be finished before submitting the PMI-ACP® application. After passing the PMI-ACP® exam, PMI-ACP® holders can begin getting PDU immediately (there is no need to wait for the arrival of the PMI-ACP® certificate). 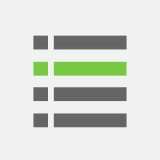 PMI-ACP® can gain 1 PDU for each hour spent on Agile related course, training, etc. PMI-ACP® holders need to accumulate at least 30 PDU in the 3-year re-certification cycle in order to be eligible for re-certification. Though some Agile courses can give you both Contact Hours and PDU for PMI-ACP® Certification, you will only be able to get either Contact Hours or PDU from the Agile course you received. There are a number of Agile certifications around, the most popular ones are Certified Scrum Master (CSM) and Project Management Institute Agile Certified Practitioner (PMI-ACP®). These certifications differ in pre-requisite, exam content as well as exam difficulty. Scrum is currently the most popular Agile framework in practice. 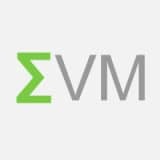 Scrum Master is a role in the Scrum framework who advocates the adoption and practices of Scrum. In order to obtain the Certified Scrum Master (CSM), one need to attend a course to understand and learn the fundamentals, terminology, practices and principles of the roles of the Scrum Master or Scrum Team Member. There is no prerequisite for Agile project experience and the role you current practice on project. The final exam for CSM is a short 25 questions exam paper and the pass rate is 100%, meaning that if you have the money to attend the CSM training workshop, you are guaranteed the CSM certification. 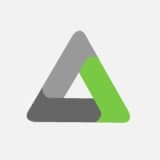 By contrast, the PMI-ACP® is specifically designed for Project & Program Managers, Product Owners, Scrummasters, Scrum Product Owners, Agile Coaches, Agile Trainers, Sr. Developers, Business and IT Managers with extensive experience in multiple Agile methodologies (Scrum, kanban, XP, lean, DSDM, TDD, ATDD, etc.). General project experience is required in addition to Agile-specific experience and education. The exam is designed to test both the practitioner’s level of professionalism in Agile practices of project management and professional versatility in project management tools and techniques. In order to maintain the quality of the PMI-ACP® certification, PMI will carry out PMI audit for PMI-ACP® certification applicants. If selected, the applicant will need to provide documents and proofs of the education and working experiences. After getting the PMI-ACP® certification, holders will need to obtain enough professional development units (PDU) within the 3-year re-certification cycle in order to re-new their PMI-ACP® certification status. Is the PMI-ACP Exam Prep Book by Mike Griffiths a must read for the PMI-ACP Exam? No. Though it is often said that the PMI-ACP® Exam Prep Book by Mike Griffiths is almost the “official” study guide for the PMI-ACP® Exam, many PMI-ACP® candidates can pass the PMI-ACP® Exam without reading it. The book by Mike Griffiths is NOT a must read if you have already well prepared for the exam though it is highly recommended if you have just begun the PMI-ACP® journey and don’t know how to proceed with your exam prep or study. My PMI-ACP® study notes are based on many important PMI-ACP® resources including some of the most important stuffs from the Mike Griffiths book: https://edward-designer.com/web/agile-communications/ If you cannot gain access to the PMI-ACP® book by Mike Griffiths before your exam, you are highly recommended to read my study notes to see if you have missed anything during your exam study. Is the Agile PrepCast valid for the new 2018 PMI-ACP Exam? Yes, the original Agile PrepCast™ covers almost all the topics of the new 2018 PMI-ACP® Exam and the team is planning to add the missing topics asap. The team at Agile PrepCast™ has carried out detailed analysis of the old and new PMI-ACP® Exam outline and found that over 85% of the contents of the new PMI-ACP® Exam have already been covered by the original Agile PrepCast™. The missing contents (e.g. Hybrid models, Agile Mindset, and SAFE) will be covered once all the new video lessons are developed. If you are planning to purchase the Agile PrepCast™ or you have purchased the Agile PrepCast™ recently, you will be able to get the new video lessons (including 9 new presentations and interviews) once they are released. But as many PMI-ACP® trainers and consultants have expressed, the new PMI-ACP® Exam syllabus is actually very much similar to the existing one, the changes and updates can be considered as “minor”. The author of the best selling PMI-ACP® Exam book, Mike Griffiths, did not intend to get the 2nd edition published before the implementation of the new PMI-ACP® Exam syllabus as he considers that his book has already covered all the materials of the new PMI-ACP® Exam. So, if you are planning to take the PMI-ACP® Exam based on the new PMI-ACP® Exam syllabus, you can still make use of all the current PMI-ACP® Exam prep materials (mock exams, text-books, PMI-ACP® Exam prep courses, etc.) for your PMI-ACP® success! How to get discounts for GreyCampus courses with discount offer codes? 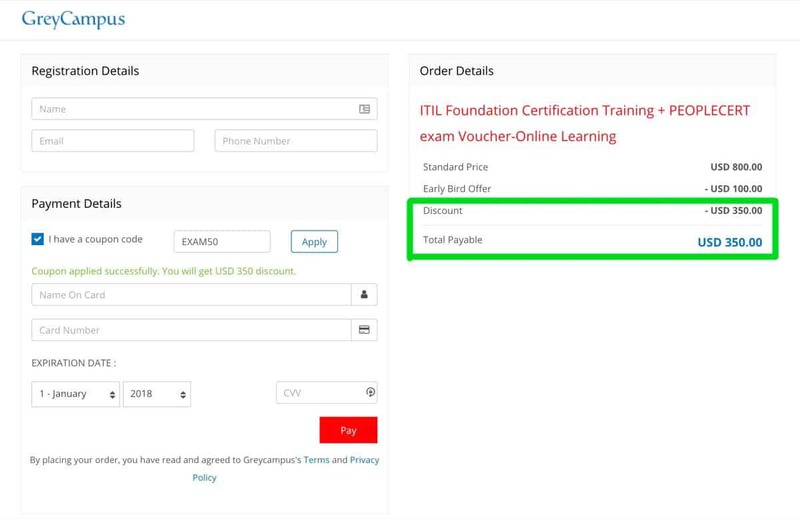 Below is the step-by-step instruction on how to input the discount offer codes for GreyCampus online courses to get the discounted prices for the ITIL® Foundation, PMP® Certification, PMI-ACP® Certification and PRINCE2® Foundation Certification online courses. Many Certification Aspirants have asked me to show them how to apply the coupon codes as they cannot find the location to enter them. This step-by-step illustrated guide is made to help fellow Aspirants to enjoy the discounted course fee with ease. 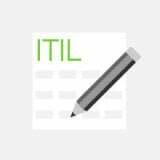 Just take the GreyCampus ITIL® Foundation Certification Training as an example. 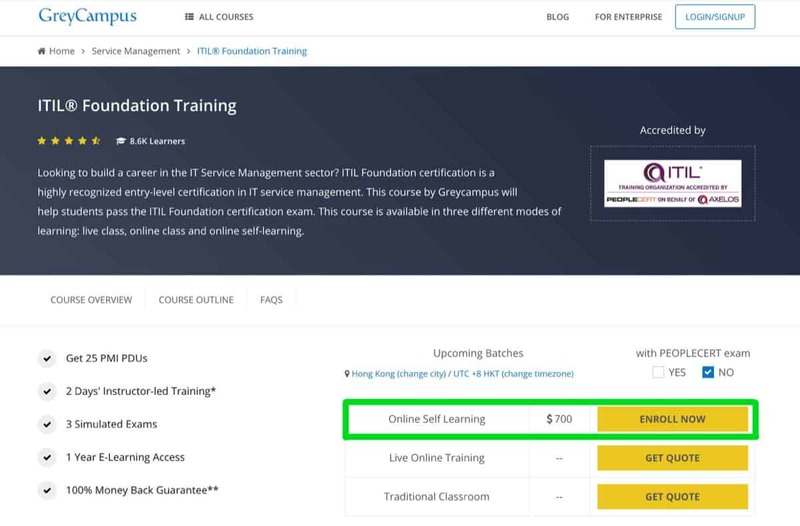 On the product page, under the upcoming batches heading you will see the Online self-learning option, click the “Enroll Now” button next to it. 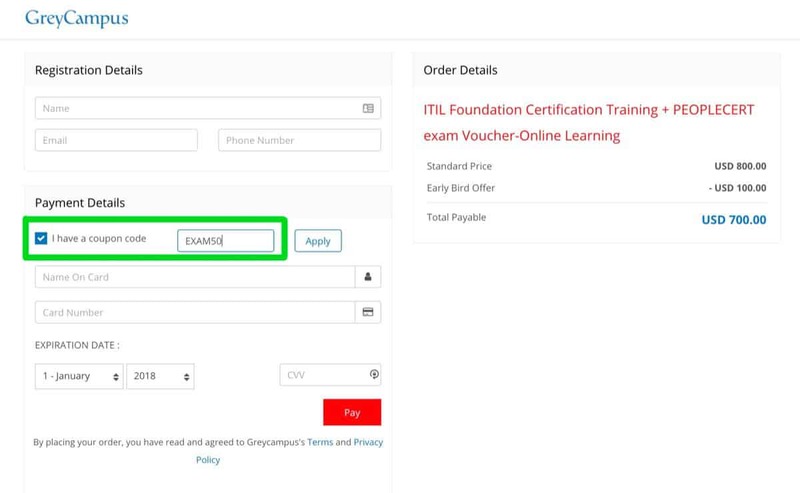 Click on the red “Enroll” button next to the option ITIL® Foundation Certification Training + PEOPLECERT exam Voucher. After clicking the red “Enroll” button, you will be redirected to the course order page. Do not worry, the price given there is the original list price before discount. On the left-hand side, under the payment details, you will find the “I have a coupon code” box- click on it. Enter the coupon code in the box that appears. After you input the coupon code in the box, make sure to click the “Apply” button beside it. The final price of the course will only change after you click on the “Apply” button. Make sure you do this before you pay for the course. Once the coupon is applied successfully, the green text will appear below the coupon code box; it will read- “Coupon applied successfully, you will get USD 350 discount”. Please also check for the discounted price details on the right side of the page. After you have ensured that the correct discounted course fee is listed on the right-hand column of the order page, you can then enter your payment information including name, card number, expiry date and CVV. Then click the red button “Pay Now” to make the purchase. Congratulations! You have just applied the GreyCampus offer code successfully. You should now be able to access the online training course (including the lecture videos, mock exams as well as many downloadable study resources) instantly. After pasting the coupon code and clicking the “Apply Now” button, a red sentence reads “The coupon code is invalid” show up. Now what? Please check carefully if you have entered the correct coupon code (note: without spaces at the beginning and end of the coupon code). 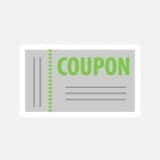 The best way to ensure the correctness of your coupon code is to copy directly from the coupon code page and paste it there. Please check the validity period of the coupon code, in most cases, an invalid coupon code means that it is expired. Usually the validity period between the first and last day of a month. And the coupon code and discount percentage may vary from month to month. Under the rare case of the GreyCampus website having some technical errors, please let me know so that I can communicate with GreyCampus to resolve the problem. 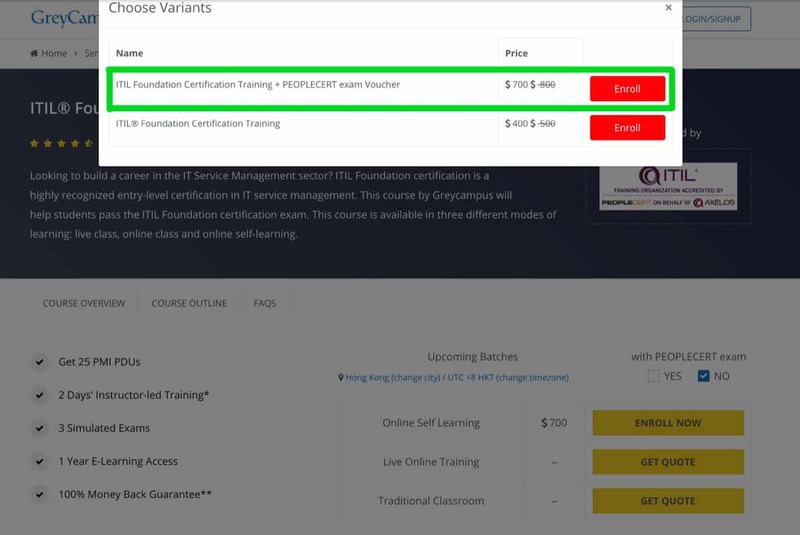 What to do if I have purchased the training course at the original list price instead of the discounted price? I am sorry to learn that you cannot enjoy the discount successfully. But there is hope. GreyCampus online courses offer money back guarantee for several days depending on the types of course. You can just write to GreyCampus to cancel your order first. And your payment will be refunded to you as soon as possible. 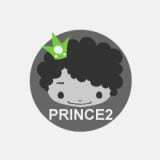 Then you can come back to the enrolment page to enrol again. Remember to follow the steps outlined above as close as possible and verify that the discount has already been applied to your order before hitting the “Pay Now” button. Where to find the latest GreyCampus Coupon Codes? As I have a working relationship with GreyCampus team, every time when a new coupon code is published, they will let me know at once. I will have the most current GreyCampus coupon code published at this page. If the code for the online course you are looking for is not there, don’t worry, you can still try the coupon codes listed there to see if they are valid. Will I get a better discount later? May or may not. That depends on GreyCampus. However, I would highly suggest you to strike the iron while it is hot. If you have already make up your mind to go for the certification and if your budget allows, why not go ahead and purchase the online course at the current discount and begin your certification right away? Time is the most precious element for all of us. Also, the certification cost may go up year by year owing to inflation and rising costs etc. The training costs may actually become more expensive later on. What is ‘sealed and signed envelope’ for the PMI audit? * If your manager / supervisor is responsible for more than one experience verification forms, he/she will need to enter the details and signs on one form only and write his/her initials on other forms without filling the details. He/She will then need to put all the experience verification forms into a single envelope and seal it with a signature as usual. What if my manager / supervisor forgets to sign on the sealed envelope containing the experience verification audit form? Not a problem. You just need to write a short notice on the envelope that your manager / supervisor forgot to sign on the envelope for the PMI audit. If I am the manager / supervisor, who to verify my experience for the PMI audit? 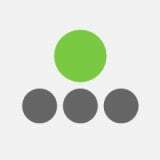 a colleague, peer, client or sponsor who has intimate knowledge of the project [to] verify. PMI does NOT require managers / supervisors to be the only persons to sign the experience verification forms. As long as the signee who are intimately familiar with the project you have submitted, it is okay for them to sign the form. PMI will accept the experience verification in such cases.